Donald Trump imagines Juan Guaidó is the rightful president of Venezuela. Mr. Guaidó, a man of impeccable illegitimacy, was exposed by Dan Cohen and Max Blumenthal as “a product of a decade-long project overseen by Washington’s elite regime change trainers.” Argentinian sociologist Marco Teruggi described Guaidó in the same article as “a character that has been created for this circumstance” of regime change. Here, his constitutional credentials to be interim president of Venezuela are deconstructed. 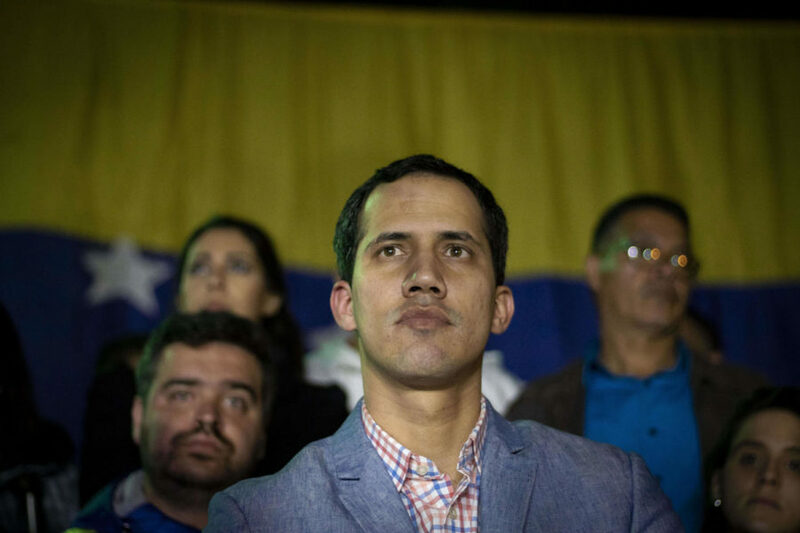 Educated at George Washington University in DC, Guaidó was virtually unknown in his native Venezuela before being thrust on to the world stage in a rapidly unfolding series of events. In a poll conducted a little more than a week before Guaidó appointed himself president of the country, 81% of Venezuelans had never even heard of the 35-year-old. To make a short story shorter, US Vice President Pence phoned Guaidó on the evening of January 22rd and asked him how’d he like to be made president of Venezuela. The next day, Guaidó announced that he considered himself president of Venezuela, followed within minutes by US President Trump confirming the self-appointment. A few weeks before on January 5, Guaidó had been selected as president of Venezuela’s National Assembly, their unicameral legislature. He had been elected to the assembly from a coastal district with 26% of the vote. It was his party’s turn for the presidency of the body, and he was hand-picked for the position. Guaidó, even within his own party, was not in the top leadership. Guaidó’s party, Popular Will, is a far-right marginal group whose most enthusiastic boosters are John Bolton, Elliott Abrams, and Mike Pompeo. Popular Will had adopted a strategy of regime change by extra-parliamentary means rather than engage in the democratic electoral process and had not participated in recent Venezuelan elections. Although anointed by Trump and company, Guaidó’s Popular Will Party is not representative of the “Venezuelan opposition,” which is a fractious bunch whose hatred of Maduro is only matched by their abhorrence of each other. Leading opposition candidate Henri Falcón, who ran against Maduro in 2018 on a neoliberal austerity platform, had been vehemently opposed by Popular Will who demanded that he join their US-backed boycott of the election. The Guaidó/Trump cabal does not reflect the democratic consensus in Venezuela, where polls consistently show super majorities oppose outside intervention. Popular opinion in Venezuela supports negotiations between the government and the opposition as proposed by Mexico, Uruguay, and the Vatican. The Maduro administration has embraced the negotiations as a peaceful solution to the crisis facing Venezuela. The Guaidó/Trump cabal’s fig leaf for legitimacy is based on the bogus argument that Article 233 of the Venezuelan constitution gives the National Assembly the power to declare a national president’s “abandonment” of the office. In which case, the president of the National Assembly can serve as an interim national president, until presidential elections are held. The inconvenient truth is that Maduro has shown no inclination to abandon his post, and the constitution says no such thing. In fact, the grounds for replacing a president are very clearly laid out in the first paragraph of Article 233 of the Venezuelan constitution and do not include fraudulent or illegitimate election, which is what the cabal has been claiming. In the convoluted logic of the US government and its epigones, if the people elect someone the cabal doesn’t like, the election is by definition fraudulent and the democratically elected winner is ipso facto a dictator. The function of adjudicating the validity of an election, as in any country, is to be dealt with through court challenges, not by turning to Donald Trump for his approval. And certainly not by anointing an individual from a party that could have run in the 2018 election but decided to boycott. The National Electoral Council (CNE), Venezuela’s separate electoral branch, has certified Maduro’s reelection, as have independent international observers. A transparent and redundant auditing process of the vote had been conducted at each polling station and all party representatives – including opposition ones – signed off on the validity of the process when the polls closed. Further, no appeal was filed by any of the boycotting parties. Maduro was sworn into office under constitutional Article 231 before the Supreme Tribunal of Justice (TSJ), which is the separate high court branch of the Venezuelan government. The TSJ had previously found the National Assembly to be in judicial contempt under Article 336:7, because the assembly had sworn in three deputies temporarily suspended because of voting irregularities. The far-right opposition has boycotted the high court as well as the electoral process. They contest the legitimacy of the TSJ because some members of the TSJ were appointed by a lame duck National Assembly favorable to Maduro, after a new National Assembly with a majority in opposition had been elected in December 2015 but not yet seated. Even if President Maduro were somehow deemed to have experienced what is termed a falta absoluta (i.e., some sort of void in the presidency due to death, insanity, absence, etc. ), the National Assembly president is only authorized to take over if the falta absoluta occurs before the lawful president “takes possession.” However, Maduro was already “in possession” before the January 10, 2019 presidential inauguration and even before the May 10, 2018 presidential election. Maduro had won the presidency in the 2013 election and ran and won reelection last May. If the falta absoluta is deemed to have occurred during the first four years of the presidential term, the vice president takes over. Then the constitution decrees that a snap election for the presidency must be held within 30 days. This is what happened when President Hugo Chávez died while in office in 2013. Then Vice President Nicolás Maduro succeeded to the presidency, called for new elections, and was elected by the people of Venezuela. If it is deemed that the falta absoluta occurred during the last two years of the six-year presidential term, the vice president serves until the end of the term, according to the Venezuelan constitution. And if the time of the alleged falta absoluta is unclear – when Maduro presided over “illegitimate” elections in 2018, as is claimed by the far-right opposition – it is up to the TSJ to decide, not the head of the National Assembly or even such an august authority as US Senator Marco Rubio. Or the craven US press (too numerous to cite), which without bothering to read the plain language of the Bolivarian Constitution, repeatedly refers to Guaidó as the “constitutionally authorized” or “legitimate” president. Roger Harris with the Task Force on the Americas and the Campaign to End US/Canada Sanctions Against Venezuela.